Preston High School is a privately-owned and operated ministry of the Sisters of the Divine Compassion. Our mission is to provide a superior college preparatory education for each of our students. Over 80% of our funding is from tuition and fees and we therefore rely critically on the timely collection of tuition in order to maintain the facilities and pay our faculty and staff. We ask that you honor your contractual obligation to pay for the education of your daughter in accordance with our following policies. All fees are non-refundable. At time of withdrawal or dismissal from the School, any tuition refund due will be calculated as the excess number of months, or fraction thereof, paid and prorated over the academic year (10 months). Any outstanding tuition and fees at withdrawal or dismissal will be calculated and is due on or before the exit interview and release of final transcripts. The General Fee includes classroom supplies & equipment, library acquisitions, administrative / testing / instructional materials, technology leasing, student handbook & planner, class / parent dues, retreats, and the annual Super Raffle. 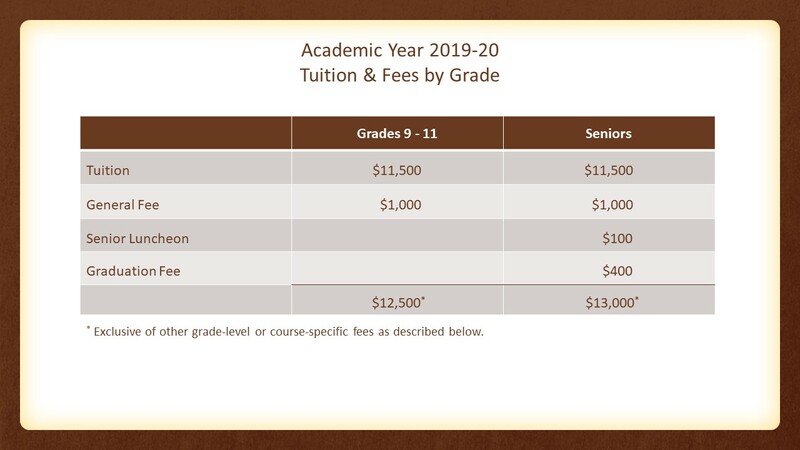 This does not include the cost of books, uniforms, and some course- (e.g., science labs, electives) and grade- (e.g., senior luncheon, prom) specific fees, which are additional. The Graduation Fee includes the cost of cap and gown, graduation medals, engraving and awards, Class Night, Baccalaureate Mass and reception, graduation program printing, invitations, chair rental, and other related expenses. The Senior Luncheon is a prelude to the Senior Prom and provided by the School at the Marina del Rey in December during School hours. Since the school must reserve the venue a year in advance, attendance is strongly encouraged and the fee is not refundable if the student chooses not to attend. A separate $200 Registration Fee is due on or before the initial registration at the School and $250 each January thereafter (except Senior year) that the student is enrolled at Preston. As a condition of enrollment and good standing, each student’s financially responsible party (the “Family”) is required to have an active online tuition account with FACTS (Preston’s tuition management provider), accessed through your FACTS Family Online account. Since the School invoices tuition, fees, and most incidental expenses through FACTS, it is the responsibility of the Family to login and review these charges on a regular basis. FACTS charges the School an annual administrative fee of $75 to create and manage your tuition account. Preston passes this fee directly onto the Family. This charge appears on your FACTS account as a School Payment Plan Fee due in full by June 3, 2019. Tuition and fees are due on the 1st day of each month, with a 5-day courtesy period, after which a late fee of $50 will be charged on any outstanding balance of $50 or more. Each Family can request one (1) courtesy late fee waiver per academic year, if tuition and fees will be made current at the time of request. No additional waivers will be granted under any circumstances. Please remit all payments through FACTS. Do not make any in-school payments. Preston requires each family to enroll a valid U.S. bank account or major debit / credit card for automatic tuition payments (Auto Pay). If you do not have, or cannot provide, either form of payment, then the School, at its sole discretion, may create an Invoice Plan for your tuition payments. All FACTS Invoice Plans are assessed an annual fee of $100, due in full by June 3, 2019. The School will require an immediate conversion to Auto-Pay for your failure in making timely payments. A 3% early payment discount (“EPD”) will be applied to the tuition portion if the tuition & general fee is paid in full by June 3, 2019 (super early payment discount of 5% if paid by April 1, 2019). A 2% discount applies when the tuition & general fee for each semester are paid in full by June 3 and December 2, 2019, respectively. A 1% discount applies to quarterly plans paid by June 3, September 2, December 2, 2019 and March 2, 2020. Full academic scholarship and SSP tuition plans do not qualify for the early payment discount. Preston defines delinquency as greater than one (1) month’s tuition outstanding. For delinquent accounts, Preston reserves the right to suspend the student from curricular and extracurricular activities and withhold interim, quarterly, and final grade reports, diplomas, and final transcripts until all outstanding tuition and fees are paid. We reserve the right to dismiss your daughter for continued delinquency. Accounts showing continued delinquency will be turned over to a collection agency or small claims court. The Family’s payment history will be reported to the major credit bureaus in accordance with the Fair Credit Reporting Act (FCRA) and NYS credit reporting laws. Notwithstanding the satisfaction of other required criteria for the tuition discount, such as minimum GPA and continued financial need, the School will rescind all Preston academic, service, or need-based tuition discounts for the remainder of the semester. Tuition discounts will be reinstated at the start of the following semester only if all outstanding tuition and fees are paid before the start of the semester. Preston is pleased to announce that we are now a Sallie Mae school. This means you can apply to finance from a minimum of $1,000 and up to 100% of your daughter's Preston tuition by visiting here. Sallie Mae offers 36-month variable-interest loans with no application fee or pre-payment penalty. If approved, the principal and interest payments begin within 30 days from Preston's receipt of the loan proceeds. Your Tuition Solution also offers affordable fixed rate education loans to finance a private high school education. If you believe you qualify for at least a $2,000 education loan, we encourage you to visit here. Both applications are streamlined, frequently with a decision in 24 hours or less. Loans for applicants with poor credit are generally difficult to find. It may still be possible, however, to get approved for an education loan if you apply with a co-signer who has good credit. We realize that a rigorous private high school education is a major financial commitment on your part and we appreciate the investment you’ve made in your daughter’s future by choosing Preston. In return, we are committed to educating well-rounded young women who accept challenges to effect positive change. Our promise to you is a superior academic experience and a variety of co-curricular opportunities at the core of your daughter’s personal and spiritual growth.